Witnesses tell Amb. Dan Shapiro of 'horror scene' at Jerusalem synagogue where Palestinian terrorists went on a bloody rampage. The United States' Ambassador to Israel, Dan Shapiro, prayed this morning at the Jerusalem synagogue targeted in a deadly terrorist attack last week, in a symbolic show of solidarity. Shapiro joined congregants for shacharit prayers at the Kehillat Bnei Torah synagogue in Har Nof, where four congregants and a police officer were murdered by terrorists wielding meat-cleavers and a gun, accompanied by the president of the United Hatzalah ambulance service, Eli Beer, and CEO of the Israelife Foundation Eli Faulk. Faulk, who is a volunteer paramedic for United Hatzalah, was among the first at the scene of the attack last Tuesday. 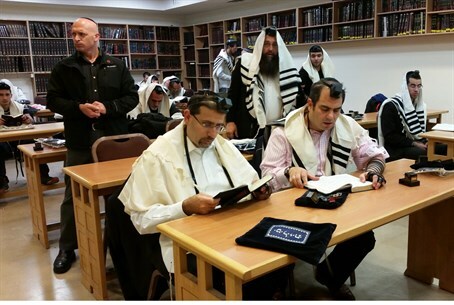 Shapiro attended the entire prayer, wrapped in his tallit prayer shawl and tefillin (phylacteries). "I saw a great need to come here on the final day of the shiva of the murder victims," Ambassador Shapiro said, referring to the seven-day Jewish mourning period. "I wanted to be here with the worshipers and with the people of United Hatzalah who acted with great devotion to save lives." United Hatzalah President Eli Beer thanked Shapiro for his visit. "We are standing in a place where a week ago Jews were murdered because for being Jewish, an event which pains every Jews in Israel and the world," he said. "But despite the pain we are continuing to live here and to pray. And that gives us strength to go on and to save lives." United Hatzalah Chairman Ze'ev Kashash also thanked the Ambassador for his support, and recounted how his organization's volunteers at the scene of the synagogue attack "saw a horror scene of Jews murdered as they were wrapped in their tallit and tefillin." Shapiro took time to meet with individual congregants, many of whom - like three of the five people killed in the attack - are American citizens. Some of them told how they were present at scene of the attack as it unfolded, and witnessed their fellow congregants slaughtered before their eyes. Congregants also showed the Ambassador the bullet holes which still remain in the walls. He also met with United Hatzalah volunteer Daniel Ben-David, who was the very first paramedic to arrive at the scene. "I live next to the synagogue," Ben-David explained. "When I got to the synagogue the terrorists were still firing. I sought shelter during the gun battle between the police and the terrorists. As soon as I was able to I entered the synagogue and saw the horror scene of the murdered lying on the floor wrapped in their blood-stained prayer shawls." "I rushed to treat the injured with doctors, paramedics and United Hatzalah volunteers who had also hurried to the scene." Shapiro also met Dr. Joyce Morel, a United Hatzalah volunteer who made aliyah from Canada two years ago to Har Nof and was also among the first at the scene. "In all my life I have never seen injuries of the kind I saw there," she said.